So, just what type of sewing furniture do you need in your sewing area? There are basically two types of sewing furniture that is needed. Some sort of table with chair is a must. The other key piece is a cutting table. For those of us that do not really have a room that can be dedicated to sewing, sewing machine cabinets are an ideal solution. These cabinets have a combination table for the machine and storage drawers and shelves for notions and supplies. Many of these cabinets or credenzas even fold up into a nice addition to any room's decor. Depending up what you want and where the cabinet will be placed and how much storage space there is, these cabinets can cost as low as a few hundred to a few thousand dollars. There are cabinets to meet just about any preference and budget. There were two really nice sites that I found with a variety of different brands of cabinets. 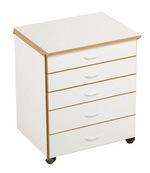 One of these sites for sewing furniture was sewingmachinecabinets.com The other site was sewingtableshop.com The Sewing Table Shop site even contains seven tips at the bottom of the page on what to consider when shopping for a sewing cabinet. This site also has sewing machine tables with a section cut into the table so that the machine sits inside and the feed dog area of the machine is at the same level as the table, thus keeping the fabric even on the surface of the table during stitching. Some of the more expensive cabinets are expensive due to the hydraulic lifts that raise and lower the machine from its storage area at the base of the cabinet to the sewing area on top of the table. These types of cabinets actually allow the area of the machine that contains the feed dogs to be at the same level as the table, thus providing a smooth flow of the material over the feed dogs and onto the table. This is especially important when there is a large project such as a coat or a quilt. Although one can also use a plain table without all of the bells and whistles, sewing cabinets provide the added feature of storage drawers that can be used for storing notions and supplies. But, what if you can't afford to purchase one of those fancy sewing cabinets with all of the bells and whistles or just want a simple sewing table? There are a number of Sewing Machine Tables that work for small spaces. 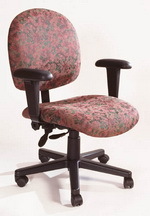 Along with sewing cabinets, sewingmachinecabinets.com and sewingmachinesplus.com also have some ergonomically designed chairs for sewing. 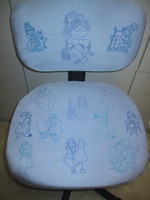 The type of chair is also very important in order to prevent back and neck strain while sewing. 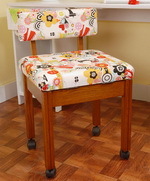 An inappropriate chair can cause fatigue and result in sewing mistakes that can lead to re-work. Although these chairs are not the only suitable types of chairs for sewing, it is important to find a good chair and they have some good examples to consider. Another crucial piece of sewing furniture for the sewing room is a cutting table for cutting fabric, patterns and even quilt pieces. Cutting tables have large surface areas, but can be made compact by folding them down when not in use. A cutting table is where the preparation work on the sewing project will be carried out. This is where the cutting, pinning and piecing will be done, whether garment pieces or quilt pieces. So, the table also needs to be sturdy, and should have a table mat to prevent the table from being scratched by scissors or rotary cutters. 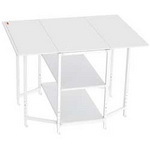 Some of these tables also have large ironing pads that can be purchased for the table, so that you can do your project ironing right on the table, thus eliminating the need for a separate ironing board in the room. There are a variety of cutting tables for consideration at sewingmachinesplus.com These furnishings can also be purchased at sewing centers such as Joann Fabrics and Hancock Fabrics, as well as many other places, such as home décor stores. 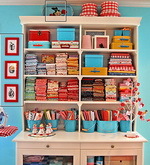 Other types of cabinets and bins will be needed for storing fabric and patterns. Depending upon the space that is available some have used wardrobe cabinets to store fabric and patterns and even notions and supplies all in one place. There are many different types of storage options for fabric and patterns, from plastic storage bins, to metal storage cabinets to wood and wood based products. It is simply a matter of cost, taste and space. There are many options for creating the kind of sewing space that will allow the sewer to be creative, productive and well organized. Sewing furniture can be both functional and decorative, thus enhancing the sewing experience.